Image Size: 10 X 18 in. 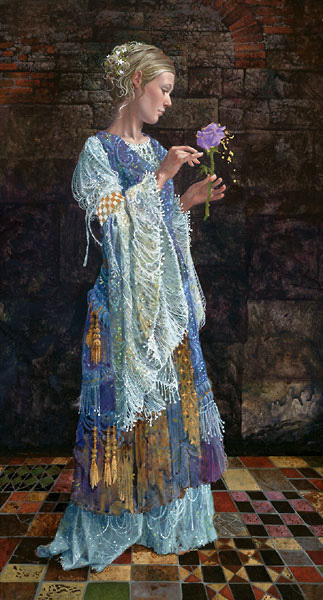 A beautiful young woman in tattered finery stands in a dark castle hall, holding a wilting rose as its petals shed flakes of gold. The elements of the story seem familiar enough—-a princess, a flower, a ruined castle—-but the story itself is nowhere to be found in our childhood memories of fairy tales. The reason? There is no story...yet. While the trappings of the tale are well-worn, the tale of the beggar princess itself is yet unwritten. How long has she walked these castle paths? Is the bloom of the rose tied somehow to her freedom? Is she even trapped? Both the history and the fate of the young beggar princess lie in the imagination of the beholder. "The Beggar Princess and the Magic Rose" offers us the ultimate fairy-tale opportunity: to write our own story,ride to the rescue and save the princess.